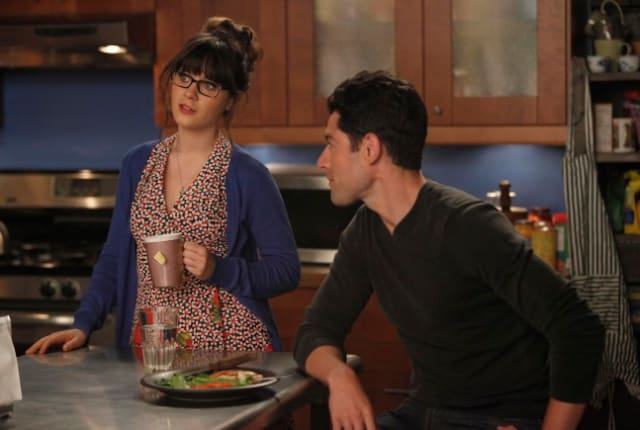 On New Girl Season 5 Episode 12, Jess offers to help Schmidt with the wedding planning after Cece accepts a promising job offer, but things quickly go wrong. When you watch New Girl Season 5 Episode 12 you'll realize how important it is to plan everything perfectly. Schmidt is ready to plan his wedding with Cece, but after she's offered a promising job she isn't able to stick around to help Schmidt out. Jess offers his assistance and Schmidt reluctantly agrees to her help. Schmidt tells Jess they will need to split up to get everything finished and he sends her to some of his appointments, but makes her wear a helmet with a camera attached to it. Schmidt gets increasingly irritated as everything Jess does, or tries, is wrong. Jess finally gets fed up and gets Schmidt to relax while also making him finally fall asleep. With Schmidt asleep, Jess goes to the local vineyard listed in Schmidt's computer and is immediately attracted to the owner, Gavin. Jess gets back to the apartment and tells Schmidt about her time with Gavin, but he quickly reveals to her Gavin is actually his father who he hasn't seen for years. Gavin shows up the apartment for a date with Jess, but Schmidt refuses to see him. Jess admits to Gavin she knows Schmidt and Gavin pleads with his son to give him another chance. Schmidt accepts his apology and invites him to the wedding. Want to see what else you missed? Go watch New Girl online now via TV Fanatic. On New Girl Season 5 Episode 12, Schmidt lends a hand with planning CeCe's wedding but things take a wrong turn when his father shows up for a visit.